I thought it was a good idea to hit up both Dr. Mike’s locations. My reasoning was simple: Because it was ice cream. And Roadfood’s “500 Things to Eat Before it’s Too Late” mentioned two different flavors that are tops. But really, our double-visit is only because it was ice cream. And all three of us rather enjoy the ice cream. 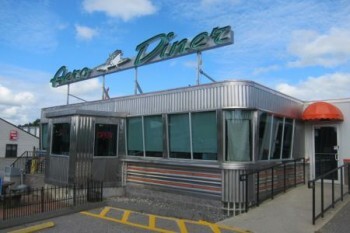 There are a few other Roadfood list entries with more than one location. Some of the others are mere pretenders; that is, the name is franchised (i.e., Swanky Frank’s) whereas others seem to be the real deal (i.e., Westbrook Lobster House in Wallingford and Pepe’s in Manchester). But CTMQ is only interested in the original joints for them. The places where it all began. Our visit to Dr. Mike’s in Bethel was a bit of a miracle. We were returning from a quick Delaware visit for a wedding and had had a rather awful trip up through New Jersey and New York. If it wasn’t construction, it was congestion. If it wasn’t congestion, it was a fatal accident on the Tappan Zee Bridge. It was pretty endless. Amazingly, Damian held up pretty well through the hours of inching along on the Tappan Zee so we first went to have lunch at a joint in Danbury at JK’s (CTMQ Visit here which is another place on the 500 Eat Before you die List. From there, we swung over to Bethel and its impossibly quaint main Street where Dr. Mike’s is located. 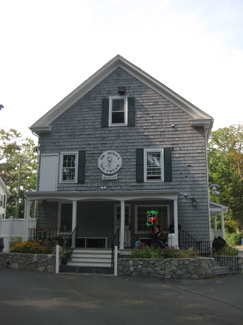 The small ice cream shop is located in the back ground floor of a large colonial building that houses other businesses as well. One such business is a dentistry practice. Now, maybe we were a bit punchy from the looooong day of sitting in traffic, but I found this guy’s sign and accreditations pretty funny. 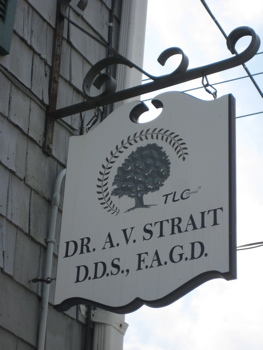 I wouldn’t have noticed his “Fellow in the Academy of General Dentistry” acronym if his name wasn’t Dr. Strait. It’s a stretch, but I don’t care. That’s funny. 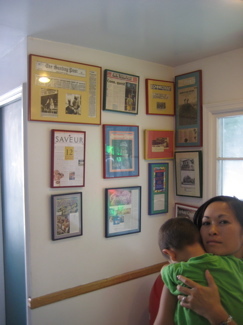 But we were there to learn about good ice cream; aside from Roadfood’s love, Dr. Mike’s has been mentioned by more than one CTMQ reader through the years. Perhaps partly due to their longevity: Dr Mike’s has been around for 30+ years now. 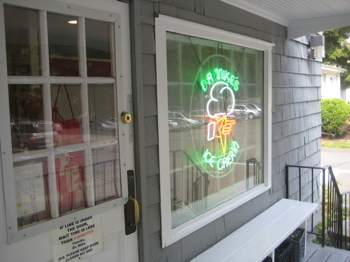 For more than a quarter century now, Dr. Mike’s of Bethel, Connecticut, has been making what we consider to be the richest ice cream on earth. There aren’t a lot of flavors, maybe eight available at any one time in the small freezer of the pint-size store; but each flavor is devilishly rich, sensually creamy, and so intense that after two scoops, tastebuds are exhausted. If it is possible for an ice cream to be too rich, this stuff is at that line of demarcation. Several of Dr. Mike’s flavors set standards only approached by other brands. “Rich chocolate” is more deliriously chocolaty than a melted Hershey bar, but with the added luxury of all that high-butterfat cream. “Chocolate lace and cream” is a Dr. Mike’s exclusive flavor, using a chocolate-covered hard candy that is made in big, webbed sheets by a local confectionery. The candy is broken into bite-size pieces and suspended in a pure white emulsion of sweetened cream: another dreamy experience, but we definitely suggest getting it in a cup rather than a cone. The crunch of the candy conflicts with the crunch of a cone. A sundae at Dr. Mike’s is an ice-cream-a-holic’s dream. One pint container is filled approximately half full with globes of the ice cream flavor(s) of your choice. The ice cream is then heaped with dark, grainy, very-hot hot fudge or a syrup of sweet/tart cherries, then piled with freshly whipped cream and topped, if you wish, with chopped walnuts or mixed nuts. By this point, the pint container is full to the top; and eating it is ecstasy. Since I had already hit the Monroe Dr. Mike’s, my choice was limited to the rich chocolate this time. (Despite the wildly changeable menu, they always have a few stalwarts available – including the “required” Rich Chocolate and Chocolate Lace.) Of course I can’t remember what the loves of my life had, but I do know they were both phenomenal. I finished off Damian’s and as I recall, it was ridiculously rich and delicious. As for my rich chocolate, it was great. 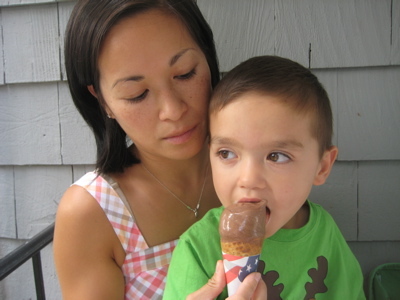 I happen to like chocolatey chocolate, so I enjoyed my cone. Stern didn’t lie above – this chocolate is hyper-chocolatized. It’s like concentrated chocolate with concentrated butterfat. It was so rich and creamy and even a bit gooey that I wasn’t sure I’d make it all the way through. It was right on the cusp of just being too much; too fatty, too rich and too “sticky” so to speak. Right on the edge. But not over it. Vietnamese has a lot of great words that sort of somehow just “sound right” regarding food. One of my favorites is béo (“fatty” or “creamy”) which Hoang’s family has sort of adapted to an exaggerated form of béo béo which means “super fatty and really creamy” – to us anyway. It’s fun to say, especially when eating artery clogging chocolate ice cream. Trust me… Hang out with us sometime, you’ll see. The Bethel location unfortunately doesn’t take advantage of the movie set Main Street of town. Set in back of the building, the outside picnic tables (there is no inside eating area at all) are next to a large parking lot. But that’s okay, no one comes here looking for a view. However, I’ll again make the complaint I wrote about the Monroe location – if I must find something to complain about, it’s these hard ice cream joints that provide customers with cheap flimsy spoons that simply cannot handle the hardness of the ice cream. For four year olds, it gets pretty frustrating. Their concept of “single scoop” is similar to my late Granny’s, where one equals three. 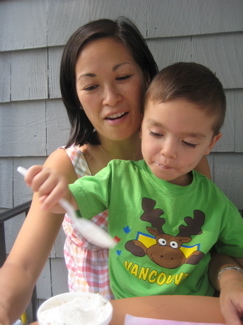 Who says you can’t have ice cream for lunch on a hot summer’s day? And with over 130 flavors in rotation, that’s a lot of summer’s days one could visit a Dr. Mike’s and be happy every time. 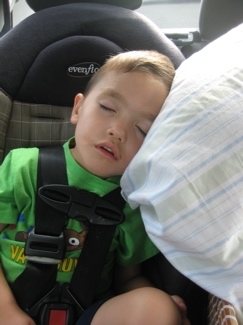 Boy, it must be nice to be able to do this after a meal on the road. Once back on I-84 East, an overturned tractor trailer screwed up our day even further, but it wasn’t too too bad and we finally got home after our 4 hour trip took 7 hours. On the bright side, neither Hoang nor I had to bother making dinner since our late afternoon ice cream held us over until the next morning.